Nurses are required to demonstrate knowledge and competence in undertaking drug calculations as part of their practice. This article aims to assist nurses in identifying their competence in undertaking drug calculations for oral medications and suppositories. 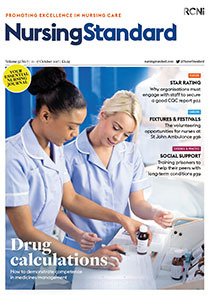 Although nurses enter their professional register with an assessed level of medicines competence, nursing is a dynamic profession and competency can decrease over time, with literature demonstrating that nurses often have suboptimal drug calculation skills. This article enables nursing students to continue to enhance their knowledge and understanding of drug calculations, and registered nurses to revisit this element of an essential nursing skill. It provides examples of drug calculations, alongside methods and formulas that should be used. It also discusses issues that potentially compromise safe practice, and relates drug calculations to the professional standards outlined in UK nurses’ code of practice.